To highlight Rare Disease Day this past February 28th, we’re featuring some personal stories from parents whose children live with rare conditions. Today, our friend Steph Nimmo, from the “Was This in the Plan?” blog tells us about her gorgeous daughter Daisy, who has an extreme form of Costello syndrome. Daisy is one of around just 250 in the world with Costello Syndrome. The mutation is on an oncogene, a cancer causing gene, which means that she has a 15 percent, increased risk of developing malignant tumors. Knowing this means that we are able to screen her regularly for tumours and be vigilant in watching for any suspicious changes. 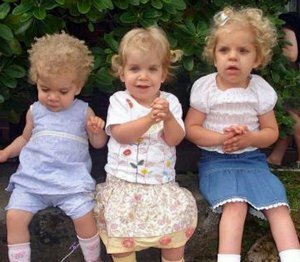 Daisy with other children with Costello Syndrome. 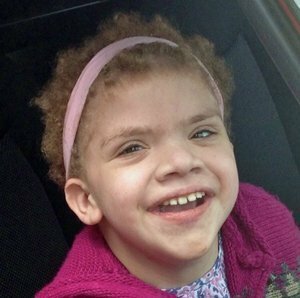 The genetics team thinks that Daisy has an extreme manifestation of Costello Syndrome, a manifestation which may have appeared before in other children but thanks to excellent healthcare and early diagnosis she has survived the odds where others did not. Our blood has been taken for exome testing, to see if there is some other genetic reason for the severity of Daisy’s symptoms. In 2009 the term “Rasopathy” was coined to group together these syndromes which comprise Costello Syndrome, Noonan Syndrome, Cardiofaciocutanenous Syndrome, Noonan Syndrome with multiple Lentigines (formerly LEOPARD syndrome), Neurofibromatosis Type 1, and other rare conditions all caused by a mutation of a gene along this common gene pathway. Over the past few years there has been greater collaboration within the research community to look at Rasopathies as a whole and their overlaps in order to identify treatments to manage the impacts of these conditions. The bonus for our family of this wider collaboration is that we now have found that some of the symptoms Daisy exhibits which are not common in Costello Syndrome are well known in other syndromes among the rasopathies. For example, epilepsy is well documented in Cardiofaciocutaneous syndrome and there are children with Noonan Syndrome who require intravenous nutrition (TPN) in the same way that Daisy does. There are multiple benefits of collaboration between rare disease groups (such as the rasopathies). In the field of genetic research, more and more is being revealed on how the mutations on this pathway impact not only the individual syndromes but diseases as a whole– The Ras/MAPK pathway is essential in the regulation of the cell cycle, differentiation, growth and cell senescence, all of which are critical to normal development. From the point of view of one family with a little girl with the rarest of the rare syndromes in the rasopathy group it means that we no longer feel so isolated and alone. Support groups are sharing information, joint conferences, research papers and symposiums. In the States, there are even rasopathy clinics with doctors who are experts in this group of syndromes and a unified website for us all to gather together wherever we are in the world. Now not only does Daisy have her Costello family with whom she shares so many traits, but she has an extended family of ras-cousins, some of whom share some of her symptoms and suddenly for our family rare does no longer means alone. If you want to learn more about the RASopathies, please go to https://rasopathiesnet.org.